Tha mi toilichte a' chiad co-fharpais a chur air dòigh air an duilleag an seo...tha mi an dòchas gum bi e ag obair! I'm pleased to be organising this page's first ever competition...hope it works! 'S e lùban bun-dùirn bhon bhuth agam air Etsy a tha ann mar duais sa cho-fharpais seo. 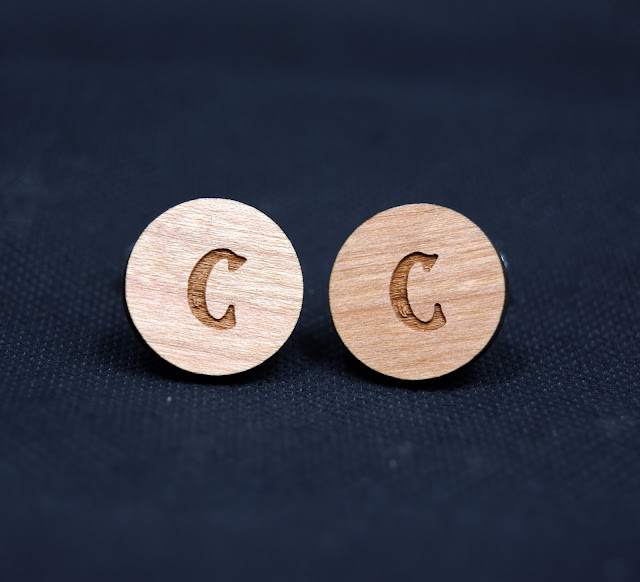 The prize in this competition is a pair of cufflinks from my Etsy shop. 'S e lùban bun-dùirn òr a th' annta, le litir air a ghràbhaladh air cearcall fiodha air gach lùb bun-dùirn. Tha bocsa beag dubh ann cuideachd - tha iad air leth math airson tiodhlac. Tha iad ri fhaicinn sa bhuth Etsy agam an seo. The cufflinks are gold plated with an initial of your choice engraved on each one. 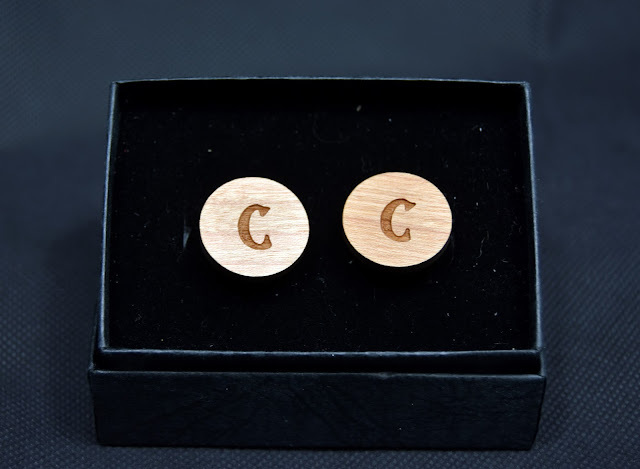 They come in a little black cufflink box, so make an excellent gift. The can be seen in my Etsy shop here. 'S urrainnear a' cho-fharpais fhaicinn fon seo. You can enter via the Gleam app below. Co-fharpais beag bìodach, dìreach airson innse dhan luchd leantainn agam gu bheil mi fhathast beò! A tiny wee competition, just to let my followers know I'm still alive! Cothrom agaibh càirt na Càisge a bhuannachadh, leis an teachdaireachd agaibh fhèin. A chance to win an Easter card, with your own message on it. 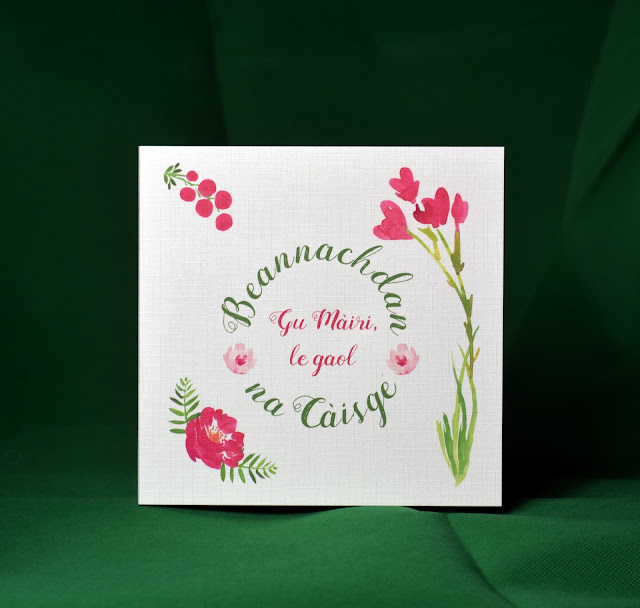 Originally designed to be printed in Scottish Gaelic, we can print the card according to the winner's own requirement for the purposes of this competition. Tha e doirbh a chreidsinn gu bheil 30 bliadhna air a dhol seachad an-dèidh bàs mo sheanmhar. Bidh sinn uile ga h-ionndrainn gu bràth. Cuimhneachain prìseil ged-tà. It’s hard to believe that 30 years have passed since my Gran’s death. We’ll always miss her. Precious memories though. Chan eil na dealbhan idir a' sealltainn cho cumhachdach, breaghaagus fuar 's a bha an aimsir ann an Lios Mòr an-diugh. Ged a bha e fuar, cha robh mi a' gearain idir a bhith a' coiseachd suas à Port a' Chaisteil an-deidh dhomh a bhith ag obair - bha e mìorbhailteach agus bha mi cho sùnndach a bhith a-mach air latha mar seo. 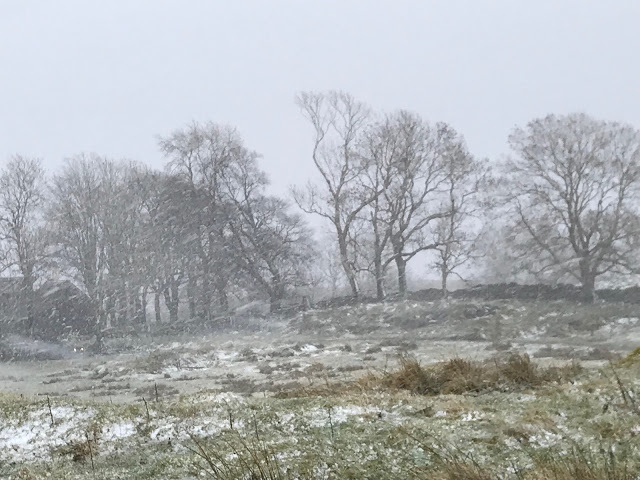 The pictures don't do justice to the power, beauty and coldness of the weather in Lismore today. Although it was cold, I wasn't complaining at all at walking up the hill from Port Castle after work - it was wonderful and exhilarating to be outside on a day like this.